Wash and Peel your Cucumbers and have a great time! After spending 2 weeks in Mexico, I have no fear of eating raw fresh fruit and vegetables from Mexico and have a new respect for Mexican produce sold in Canada. But washing and if necessary peeling your produce is a must. I use “Nature Clean Fruit & Veggie Wash” and put a drop or two in a bowl or in the sink, add water and thoroughly wash all my produce. 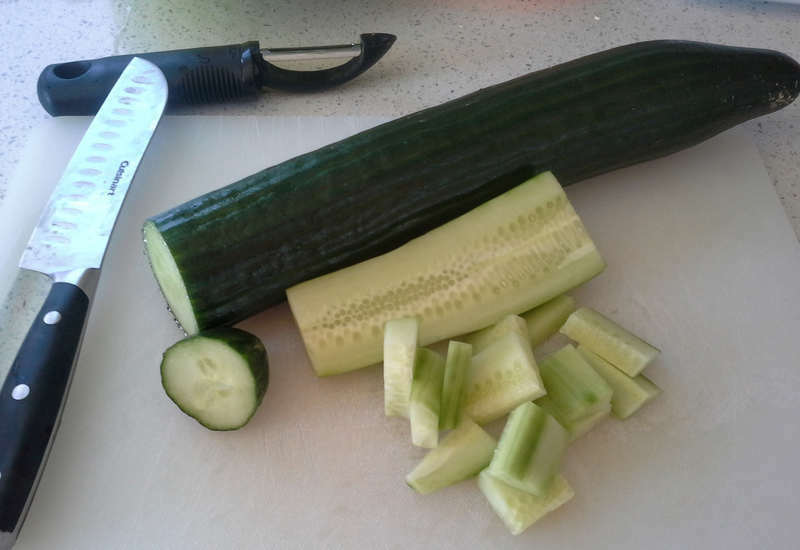 Ever since the 1985 incident with cucumbers here in Vancouver, I also peel my cucumbers. During May and June of 1985 the Health Protection Branch and several other agencies were involved in the investigation of over 300 reports of illness reported in the Vancouver area of British Columbia, Canada. Symptoms reported included nausea, vomiting, dizziness, muscle fasciculation and blurred vision. A review of the onset of symptoms and food consumed suggested that at least 140 people had become ill from eating cucumbers adulterated with a carbamate pesticide. The presence of residues of aldicarb in cucumbers from one particular producer was confirmed by laboratory analysis. So when I see heading like this from Nutrition Action, it serves as another reminder that peeling my cucumbers is still a best practice to avoid getting sick. What: A total of 73 people in 18 states have been infected with Salmonella Saintpaul from contaminated Mexican cucumbers, the Centers for Disease Control and Prevention (CDC) reports. Of those sickened, 27% have been hospitalized. Public health investigators have traced the source of the illnesses to cucumbers imported by Daniel Cardenas Izabal and Miracle Greenhouse, both of Culiacán, Mexico. On April 24th, 2013, the U.S. Food and Drug Administration (FDA) put those two firms on import alert, which denies entry into the United States unless the companies can provide evidence that their cucumbers are Salmonella-free. There is no evidence that cucumbers from those firms are still being sold in the US.